Hello! 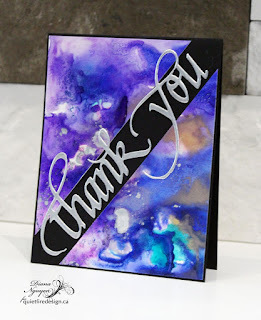 Today I'm sharing a set of notecards I made for my son to use as Thank You cards. I'm running late so they needed to be really quick and easy. But since I'm not big on mass producing, I needed a bit of variety to them. Yay for Quietfire dies! 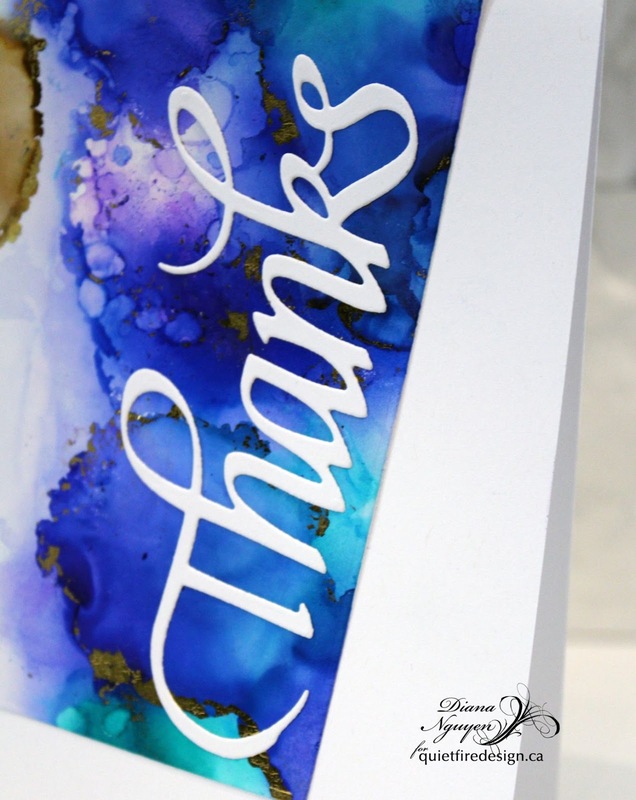 Did you know that there are 3 different "Thank you/Thanks" word dies available? You would think you only need one but I find that having them in different sizes and arrangement really helps. First, I finally jumped on the alcohol ink background so I had a bunch of them laying around. Most were on the 5"x7" Yupo paper so I simply cut them in half and adhered them to a white card base. And then I got a little more creative with cuts. 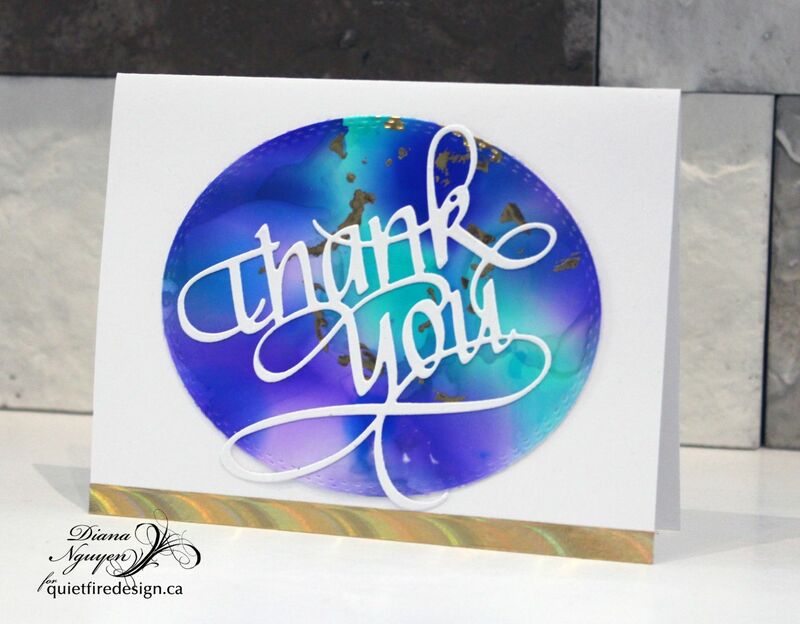 For the first card, I simply die cut the new Thank you 3 metal die and placed in on the bottom of the triangle. I did add a layer of Crystal Effects on the die to add just a bit of depth to the die cut. 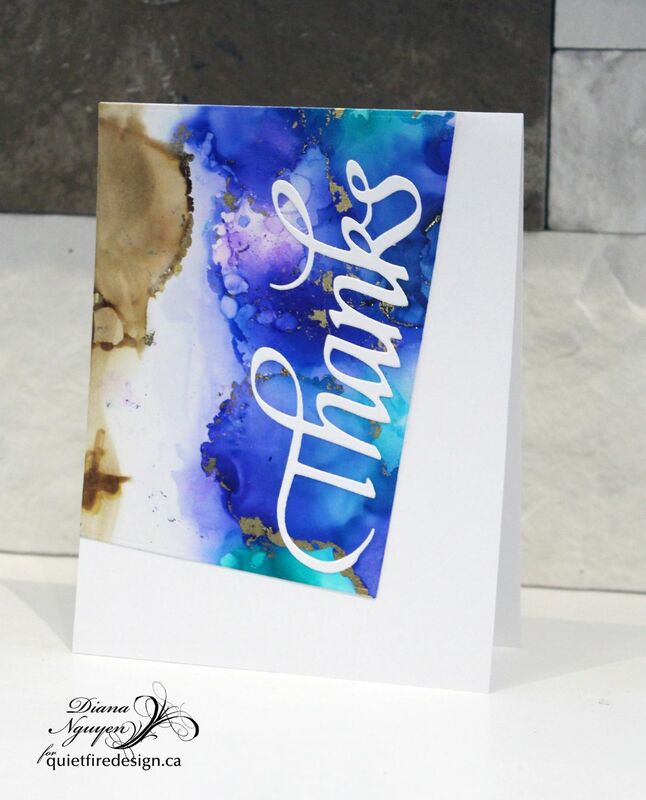 For the second card, an older Thanks die went perfectly in the angled background. 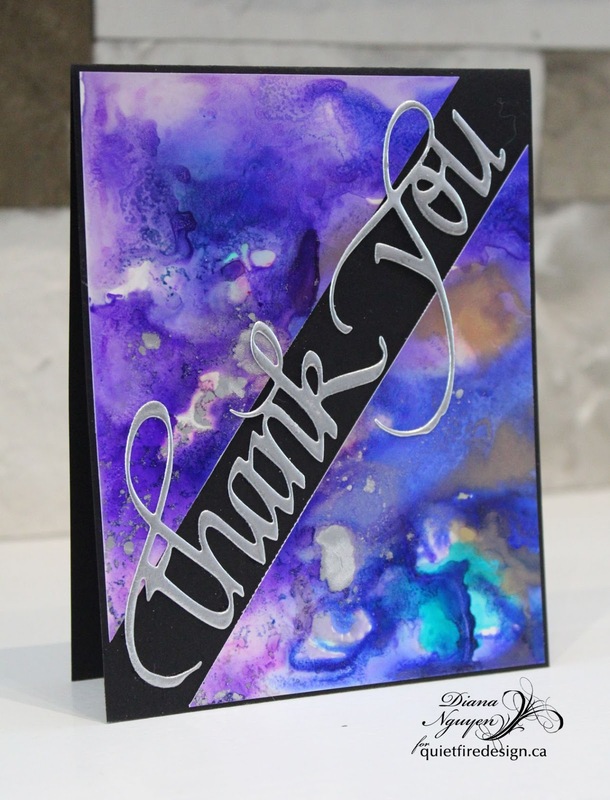 For the third card, I embossed in silver and split the background along the diagonal. The last one is simply an oval with a bit of washi tape along the bottom. I'm really glad I had all these different dies that said essentially the same thing because it made the different layouts I had come together easily. Which was your favorite? I like that one too! Not sure what planet I’ve been on, but I didn’t realize Suzanne had created THREE variations of “thank you!” I only have one and use it constantly. Guess I’d better give the other two a good home, too. I’m not an alcohol ink person, but admire their use. Yours are magnificent! 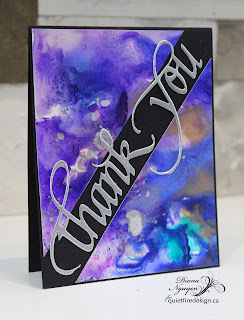 Love the blues/purples together— very night sky looking. I think I’d have to choose the oval as my favorite, although I changed my mind three times before deciding. Any one of them would be a joy to receive. 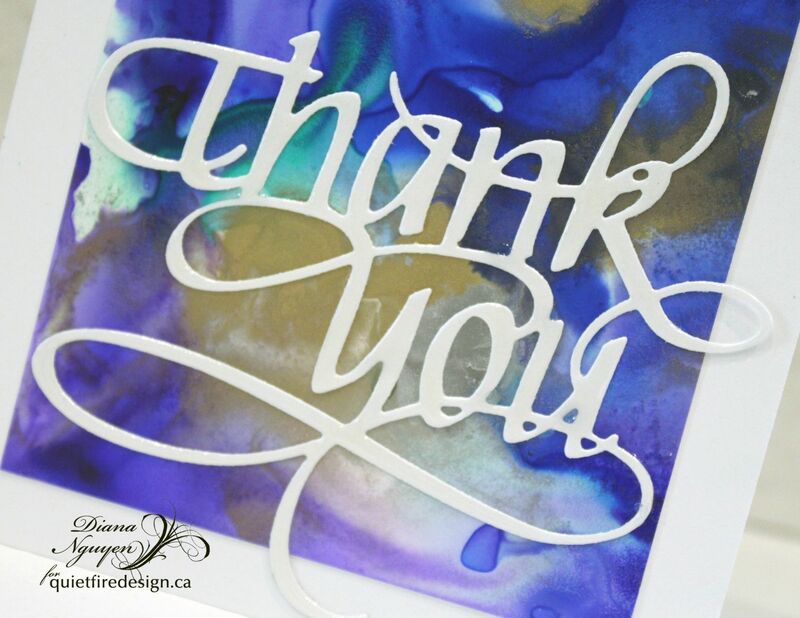 And one final note from one mom to another— I had to smile that your son needed some thank you cards. A child (no matter how old) who sends written thank you notes is to be treasured! Well done, Mom! Thanks for the mom encouragement! You know we could always use those. (My son just turned 14 - let's see if the lesson sticks!) 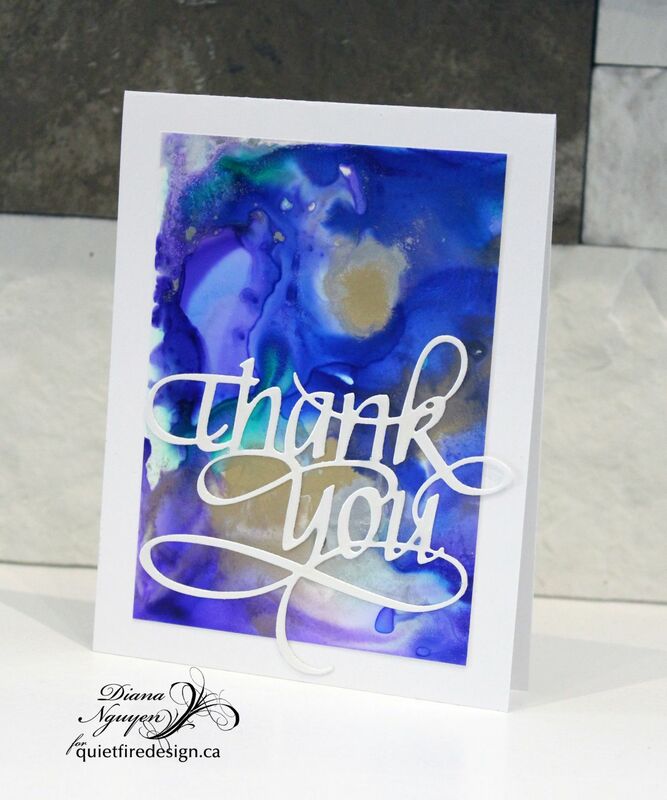 I wasn't an alcohol ink person myself but these backgrounds are crazy quick - wish Yupo was cheaper though. Christmas in July- Periodic Table "Ho Ho Ho"
Christmas in July- "Peace" + a Giveaway! Welcome to the Quietfire Christmas in July Week!